The recently opened Makerspace area in the Memorial Junior High library is providing students exciting opportunities to learn and create using state-of-the-art technology. 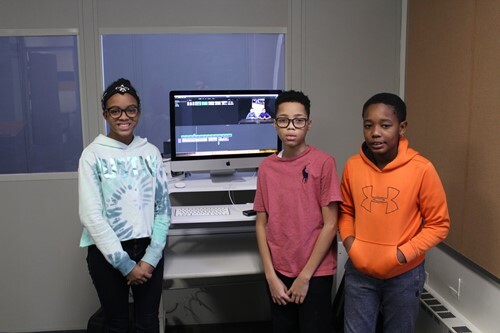 A prime example is the collaborative efforts of 7th graders Sarah White, Jermaine Hill and Dwayne Amey to create an ESPN-style multi-media production titled Sports Talk. The production features footage of student athletic games filmed by Jermaine and Dwayne on their phones, as well as still photos taken by Sarah. All live footage is edited using iMovie, a free video editing app developed by Apple, while photography is edited in Adobe Photoshop. Using green screen technology, Jermaine and Dwayne are filmed providing commentary on game highlights with footage played on the screen behind them. Sound editing is performed in the state-of-the-art recording studio. The finished product is posted on a private YouTube channel for students and staff to enjoy and is an impressive multi-media production that showcases the talents and collaboration of the trio of students. In addition to producing the Sports Talk program, all three students are in the process of filming a documentary of the Memorial girl’s basketball team which will include player interviews. Congratulations to Sarah, Jermaine and Dwayne for demonstrating creativity, diligence and Arc Pride in their work!